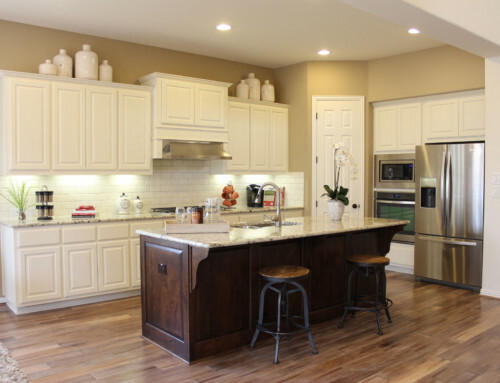 According to the 2017-2018 American Pet Products Association’s National Pet Owners Survey, sixty-eight percent of U.S. households, roughly 85 million families, own at least one pet, and 60 percent of those pets are dogs! 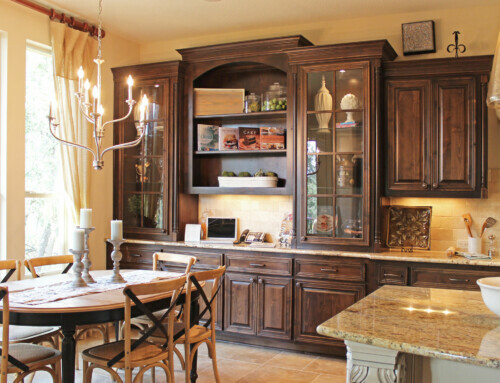 Many people consider their dogs an important part of the family. 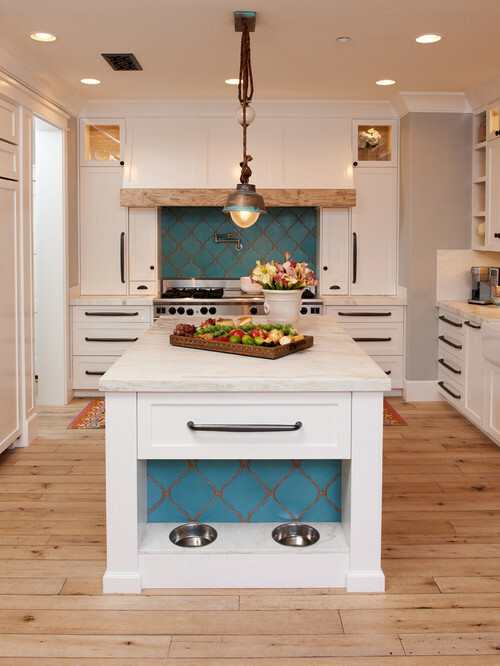 As such, the comfort and needs of our furry friends should be taken into consideration when undertaking a home remodel or new home design. 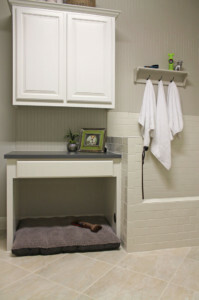 We’ve photographed several great dog-friendly homes this year, and below we share a few unique, dog-friendly interior design ideas and photos, with your beloved friend/pet in mind. 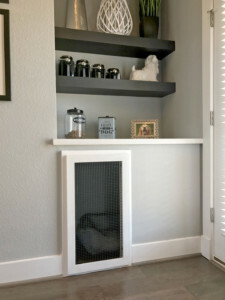 One design we’ve seen gaining steam is a kennel out in the main living area so Benji can still be part of the action even if he needs to be detained for a little bit while the front door is open for big deliveries, floors are cleaned, babies roam the room, etc. 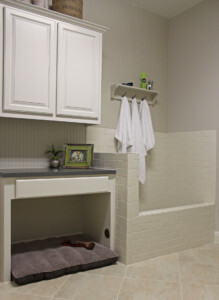 The most-liked photos we’ve posted this year on social media and Pinterest feature a pet-friendly shower in the laundry room, built just the right size for pet bathing and grooming, with a hand-held shower nozzle and tile enclosure. 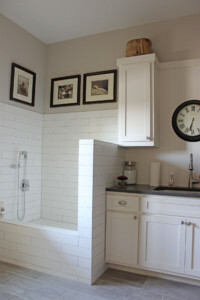 This also works well as a clean-off spot when you’re coming home from a tough-mudder or when the kids discover it’s fun to make mud pies. 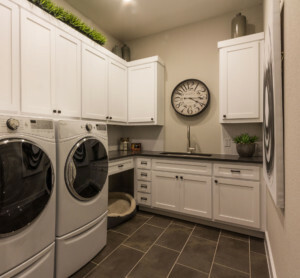 The laundry rooms below all feature TaylorCraft’s custom cabinet doors and drawer fronts. 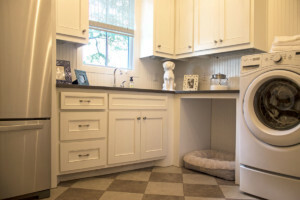 The laundry room also serves as a cozy spot for a dog bed right next to the dryer for some warmth and white noise. 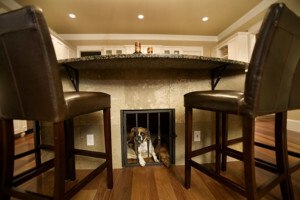 As an alternative to a locking kennel, we’ve also seen a pet cave that gives a dog space to hide away and feel safe but come out whenever he’s ready with a swinging door that opens with just a little nudge. 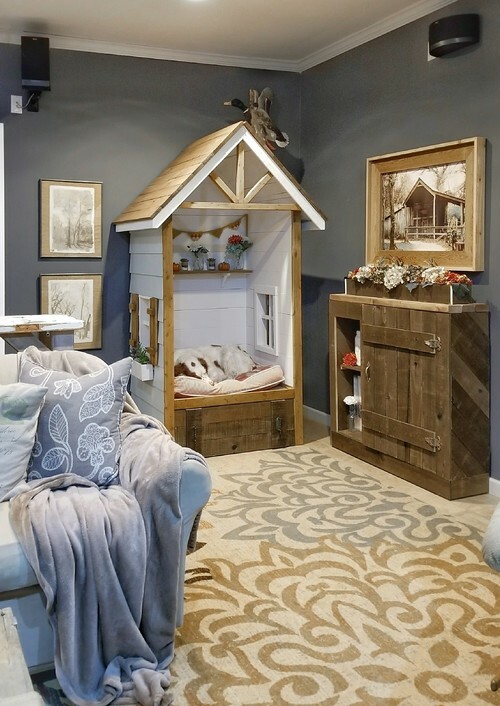 This indoor dog house featured on Houzz looks super cozy and was made to fit with the country-rustic interior design, complete with a knick-knack shelf, flower box and divided lite windows. 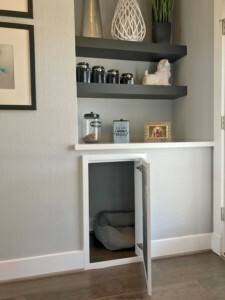 We’ve also seen lower cabinet drawers with built-in dog and cat bowls that can be tucked away for a clean look when they’re not being used, cabinets with built-in steps up to a cozy window-seat dog bed, and special pull out cabinets that hold bins for dog and cat food. 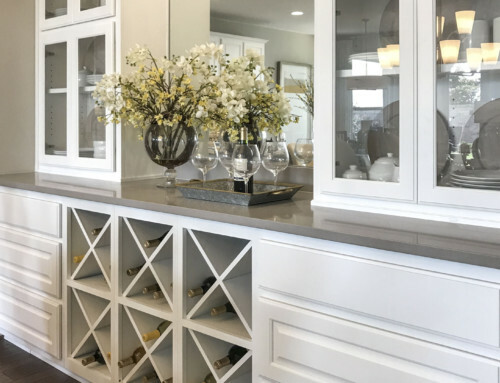 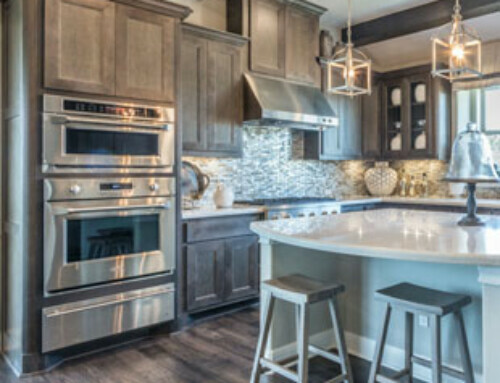 For more photos featuring pet-friendly interior designs visit TaylorCraft Cabinet Door Company’s Pet Friendly Home Interior Design Ideas Pinterest Board.